A brief exploration of the Harris landscape will reveal a huge amount about the history, the traditional way of Island life and its dependence on the land. People settled on Harris over 3,500 years ago establishing settlements along the coast, living off the sea and small scale cultivation. Root vegetable and grain crops were cultivated on raised beds known as feannagan in Gaelic or ‘Lazy beds’ in English. Although many remote areas that were cultivated have now been abandoned, the characteristic lines of the lazy beds are still a feature of the landscape. Fertile coastal grasslands known as machair were the favoured areas for cultivation, but as the population grew, areas of peaty and rocky moorland were brought into cultivation. Today it is hard to imagine entire villages surviving in the remote moorland areas where black house remains and lazy beds can still be seen. Many of these settlements became deserted during the clearances when people were evicted from the land by landlords to make way for sheep grazing. People were left without land or left with only the poorest areas of land and this resulted in many people emigrating from the island. On many remote hillsides and glens, the remains of sheilings can be found. These small simple dwellings were the summer residence for young people who would take the cattle into the hills for grazing to allow areas around villages to recover. In some areas the unmistakable outlines of old peat cuttings can be seen. Harris has been almost treeless for thousands of years, and as a result, timber as a source of building material or fuel has always been scarce. 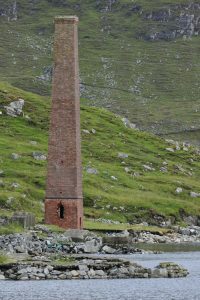 Until very recently peat, formed from the accumulation of plant material, was the main fuel source across North Harris. Although most households are now heated using oil, there has been a recent resurgence in the use of peat. Several old peat banks have been re-opened ensuring that the evocative smell of peat smoke lingering around townships on winter evenings is here to stay. Since 2004 archaeologists from Birmingham University, working in partnership with local development organisation Harris Development Ltd have been carrying out surveys and excavations, recording shielings, beehive dwellings, and black houses adding to our understanding of the area’s history. 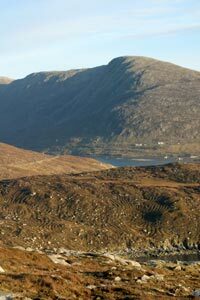 A local amateur archaeology group Linn Gu Linn have also been recording at a number of sites throughout Harris. 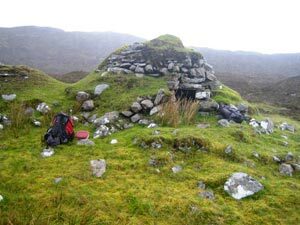 There are well preserved Beehive dwellings at Both a Clar Bhig, a remote area on the border with Lewis. At Sron Ulladal there is a large cave which as legends tell has been used as a hiding place and place of refuge or shelter possibly dating back to Neolithic times. The remains of a Whaling station can be found at Bun Abhainn Eadar. 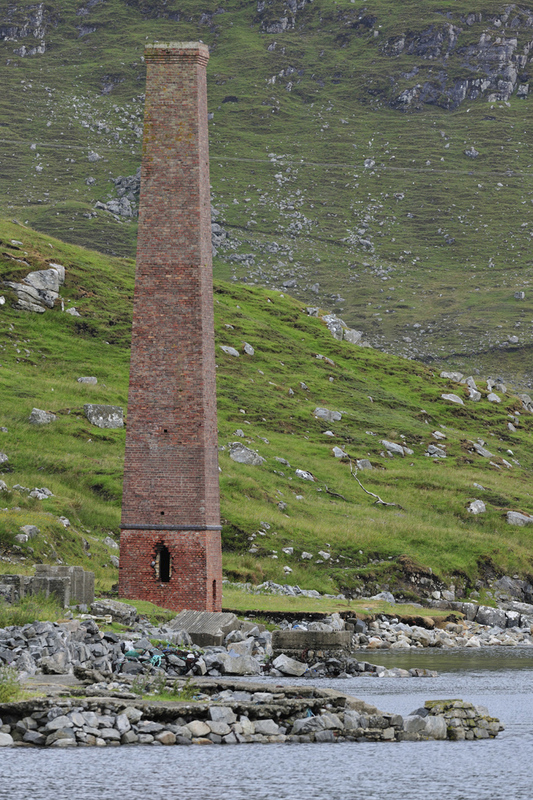 This scheduled monument was the last whaling station in use in Britain and is one of very few relics of what was once a thriving industry in the area. Most of what is left is the brick chimney where blubber was rendered down to make oil for heating and lighting. However, due to erosion from the sea, the remains are in need of restoration work. A conservation plan for the station has been prepared and the Trust are currently looking into ways to fund the considerable restoration work that is required to conserve what remains and to make the site safe for visitors. The islands of Scalpay and Harris have a strong maritime tradition. The Eilean Glas lighthouse on Scalpay is a testament to that tradition. The Eilean Glas Lighthouse takes its name from Glas Island, Scalpay, and stands at Rubh’ an Eòrna at the south of the island. 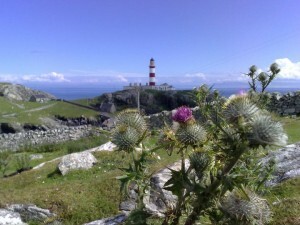 The lighthouse was one of t he first four to be built in Scotland, and was first lit in October 1789. The tower that stands on the site just now was built in 1824, and was designed by the engineer Robert Stevenson. The Lighthouse is a popular tourist attraction and while it is not accessible by car it is accessible on foot via a newly upgraded footpath.